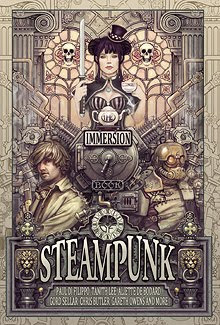 This weekend you'll be able to get your hands on The Immersion Book of Steampunk at FantasyCon in Brighton. Look out for the Immersion Press stall in the dealer hall. Meanwhile, you can check out cover artist Charlie Harbour's work at his new website, including a much bigger version of this glorious cover. That's seriously cool. What a great looking cover! Going to add you to my google reader, awsome stuff. Maintain it up and u have a loyal reader.